George Cruikshank’s etching Oliver Asking for More illustrates what is possibly the most famous line in Charles Dickens’ Oliver Twist. Originally called The Parish Boy’s Progress, Dickens’ tale first featured in a monthly magazine, Bentley’s Miscellany, in 1837 before being published as a book in 1838. Both Dickens and Cruikshank observed the London public and were known for creating quite accurate portraits of impoverished Londoners through their respective artistic mediums. Cruikshank had been a friend and colleague of Dickens for many years, and illustrated two other works by the writer, including The Mudfog Papers and Sketches by Boz. Eventually, Cruikshank’s extremely conservative views on temperance created a divide between the two, and they severed their creative partnership for good. 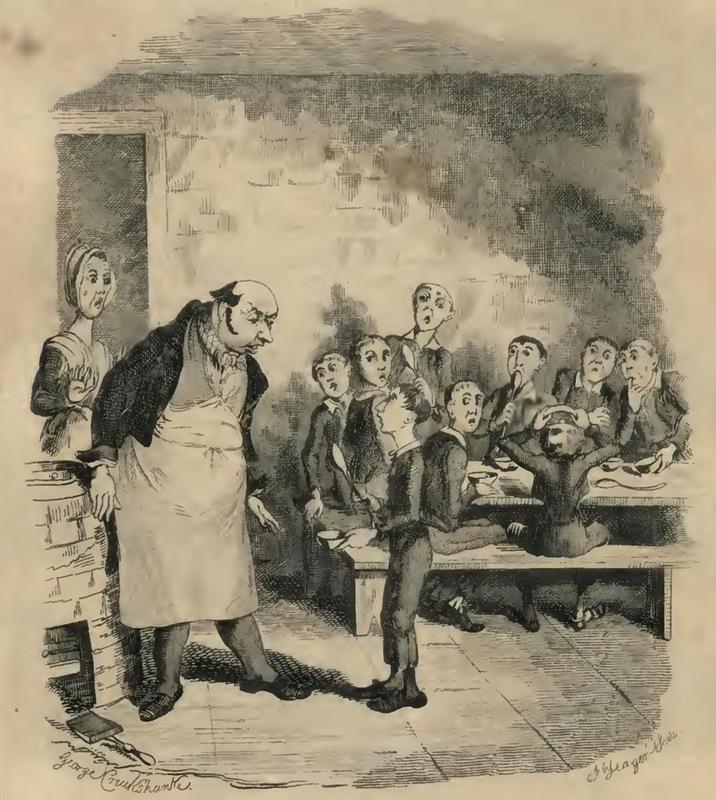 Oliver Asking for More is considered to be one of the best works Cruikshank ever produced, as it is an example of how an image can define a story just as much as the author’s text. Unfortunately, these images for Oliver Twist were the last that Cruikshank made for Dickens due to their falling out. Oliver Twist went on to sell many copies and in an edition printed in 1911, Cruikshank’s illustrations were eventually printed in color.